Who doesn’t love potatoes? Poor little guys sure get a bad rap. If any of you have read Dr. John McDougall’s The Starch Solution, you know they don’t deserve such abuse. Potatoes are a satiating, healthy food, chock full of fiber and nutrients. As Dr. McDougall says, it’s the company they often keep that turns them into a bad food (butter, cheese, oil, etc). Potatoes, without all the bad stuff, should be part of the regular diet, and they definitely are in our house. 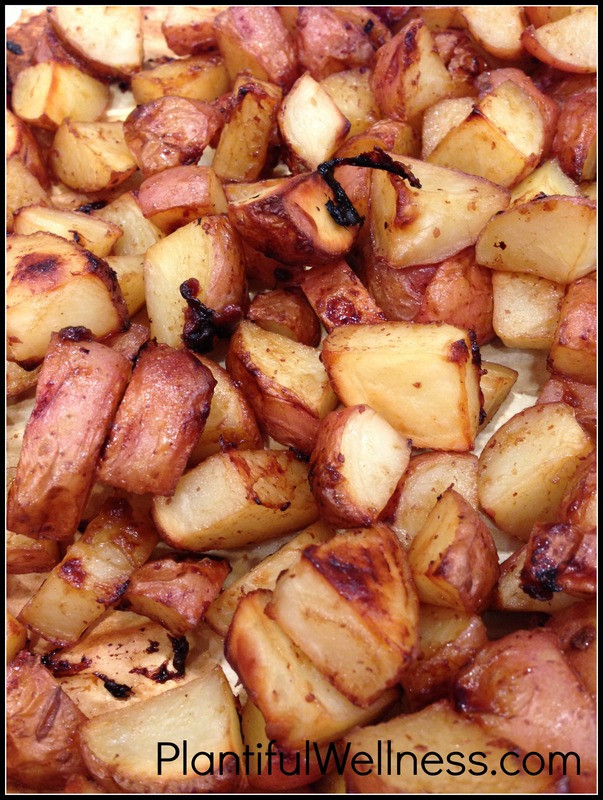 Yukon, red, gold, butter, russet, fingerling, sweet….if it’s a potato we eat it. My sister Julie loves potatoes so much her nickname(s) lovingly given to her by my husband is “tot” or “tater”. Since she is the one who came up with this recipe, I’m referring to them as taters, in her honor. These are delicious and super easy to make. This makes a sizable batch since we had them as our entree, along with steamed broccoli – perfect meal! The amounts listed are estimates so be sure to taste test and adjust before cooking, if necessary. It’s hard to mess this one up so not to worry! Great as a side dish or main entree, these roasted potatoes are a little sweet, a little spicy, a little tangy, and a little salty. Yum! In small bowl mix together maple syrup, mustards and balsamic. Place parchment paper on large cookie sheet and spray with high-heat cooking spray. In a large bowl mix cubed potatoes with maple mustard mixture. Season with salt and pepper and stir. Transfer to baking sheet and cook 45-60 minutes, stirring a few times. This entry was posted in Blog, Recipes and tagged gluten-free, maple syrup, mustard, oil-free, potatoes, soy-free, vegan by Shelly Detken. Bookmark the permalink.